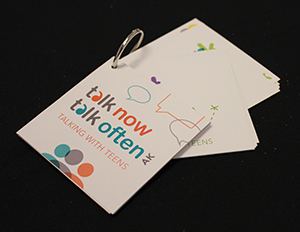 Thank you for your interest in the Talk Now Talk Often AK Conversation Cards. Cards are available for free both in print and online. Please click here to download a printable version. To order cards please fill out the form below. Quiz: We need to verify you are a human. Please answer the basic math problem below. * Notes it is a required field. You may order up to five sets of the Conversation Cards free of charge on this order form. If ordering more than five please contact us directly at tntoak@andvsa.org. This order form is only for Alaska mailing addresses. If you live outside of Alaska and want to place an order, please contact us directly at tntoak@andvsa.org.